The original inflatable obstacle course and the smallest in our line up, the 25 ft. Obstacle Course offers plenty of challenges. Complete with tunnels and an extra soft bouncy base, it's perfect for your youngest adventurers. The easy to maneuver challenge begins with a front-loading entrance and leads to tunnels and pop-ups to build confidence. 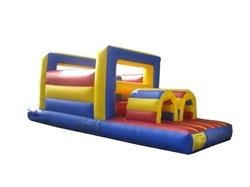 Our inflatable obstacle courses are constructed out of strong vinyl for durability and safety.